I'm Mining for Monero crypto currency & so can you, it's easy! How do you mine for yourself? I am happy to set this up for anyone that wishes to do the same for themselves. I charge a one time fee of £75. For this I create all of the required accounts, tie them together and then send you the code to embed on a web page on your server/hosting space. I can send this either as the plain code or I can send you a html web page to ready for uploading. I will also send you a word document detailing your log in credentials, you are welcome to change the passwords at any time. Please keep this document safe! What if you don't have a server or hosting space? No problem, I am happy to provide some web space on my business server for £12 per year. Your mining address would be www.webmadness.co.uk/yourname.html. Send me an email and we'll start the process together. This is the number of hashes you are making per second. TECHNICAL INFO: Hash per second is an SI derived unit representing the number of double SHA-256 computations performed in one second, referred to as hash rate. This is the number hashes you have made in the current mining session so far. The default of 4 is fine for most modern day computers and laptops but please feel free to experiment and change this setting. TECHNICAL INFO: Each thread requires 2MiB of memory. That's because an instance of CryptoNight hash function requires a 2MiB scratchpad. If it can all fit in CPU cache it is much faster because RAM is much slower compared to CPU cache. So, as a rule of thumb, if you divide your CPU cache with 2 and you should get the optimal number of threads for mining with your computer. The default is 90% which again is fine for most modern day computers, laptops and mobile devices. If you find that your web browser is freezing or you are unable to use your computer with this running in the background then please lower the speed rate to suit. The mining widget on this page is mine, so thank you if you are mining for me whilst reading, every hash counts!! Click the 'START MINING' button on the mining widget. Does it cost me anything to do? No, it uses only some of your device's processing power to solve complicated calculations, this makes hashes; and the hashes in our case mount up to make the crytpo currency called Monero (XMR). Whilst your computer or device is on anyway you can just run this in the background. If you find your browser is freezing or your device is running too slowly whilst mining please use the controls to lower the SPEED rate. No, the software required is through a widget on a web page, the same as is on this page. Does it download anything to my computer or mobile device? No, the mining widget is browser based. As long as you like. The more hashes made the more Monero made. The current payout is 0.00002952 XMR per 1M hashes. How do I see how many Hashes I have mined and how much Monero I have made? A stats page is provided in an online mining account. What happens to the Monero I have made? Once made it is automatically sent to your online wallet. The minimum payment to the wallet is when you reach 0.5 XMR. What can I do with my Monero? Using the online wallet you can send, spend and buy/sell your Monero. There are many online brokers that will simply buy your Monero, if you decide to sell. Monero (XMR) is a privacy focused crypto currency. Mining Monero can be a profitable venture due to its cryptographic algorithm which is resistant to ASIC's mining. This means that anyone with a CPU or GPU can mine for Monero through a web browser. Monero is the first, and currently only, crypto currency that can be mined through a web browser. You may have seen in the news recently that some websites have been mining in secret in the background on their web pages using their visitors computers/mobile devices. Since all this has come to light this action is now being blocked by a majority of Antivirus softwares, so any web page that is mining in secret will be inaccessible to the general public. Whilst these web pages don't actually pose a threat to the unknowing visitors computer or mobile device, it is highly unethical to do it without the users (and website owners!) knowledge. Naturally, technology develops (fast!) and finds a solution; so, now we have a widget with a button to press making it optional for the user instead. This system has already been snapped up by an online magazine to use as an alternative method for subscription payments: http://www.bbc.com/news/technology-43053783. Monero is also an untraceable crypto currency, Bitcoin is traceable. Even though the blockchain records transactions, it doesn't record it like "address 1 sends to address 2," as in Bitcoin. The Monero blockchain doesn't keep track of address balances. There is therefore no rich list. There are simply outputs to which your wallet claims ownership with its private keys, if Monero was sent to you. This is called stealth addressing. Consequently, it has become popular on the dark web as a means of payment. For Monero this is actually a good thing since the more that use/want it the more value it gains. In January 2017 one Monero was worth $10. It currently fluctuates between $300-500. It is fast becoming popular online as an alternative method for paying for services, products and access to content. 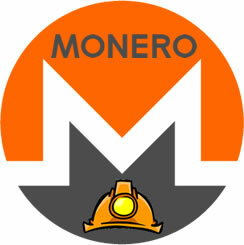 I started mining a couple of weeks ago, and yes I have a fair way to go still to make one full Monero, but because of the recent developments, in particular its growing popularity on the dark web and the use of it as an alternative payment method on normal everyday websites, I feel that by the time I have made one full Monero it may be worth a silly amount of normal money, similar to how Bitcoin is now. Of course, this is NOT a guarantee! This is crypto currency, it kind of doesn't exist but it does, and anything can happen, but since it costs me nothing to mine for it... I missed out on Bitcoin, I could have bought them for just a few dollars at the very start of that, but I didn't, and I'm not willing to miss out again!! !